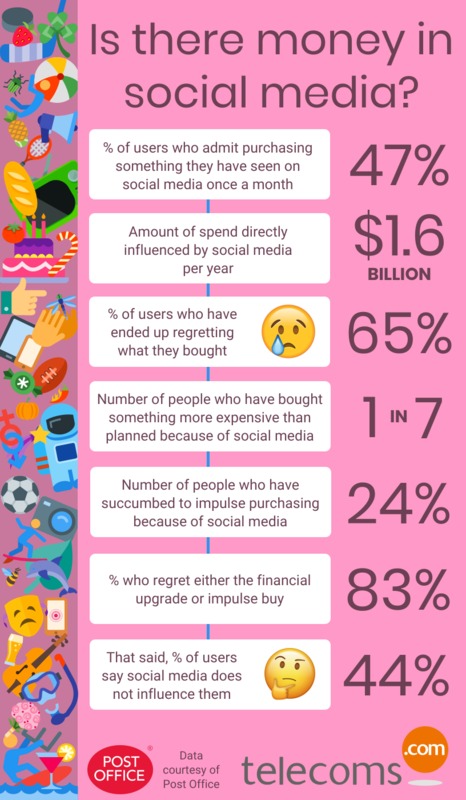 Infographic: Does social media influence our spending? Advertising on social media is nothing new, but some sceptical individuals might question whether there is any value in it. New data from Post Office Media argues the case it is more influential than we think. The majority of people are stubborn. This might sound like a very broad statement, but look at the person sat next to you and ask whether it is true. Despite the Post Office’s data showing a substantial chunk of us are influenced by friends or celebrity posts, or sidebar adverts and featured content, we still deny it. As you can see from the infographic below, social media advertising is very real, and big business. Maybe there is something to the digital economy? Please note, the statistics below are for the UK. As always, if you have any interesting, shocking or quirky statistics, feel free to send them through to jamie@telecoms.com.